Time for another "Text Talk" book review! 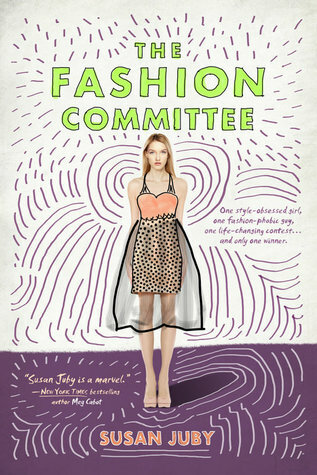 The Fashion Committee is a great book for sewists who are also readers, especially if you love teen fiction. I've read many of Canadian author Susan Juby's other teen & adult novels and enjoyed them, but this one has quickly become my favourite! Maybe it's because of the theme: fashion. In this book fashion design & enthusiasm for Making takes top billing. The chapters go back and forth between the viewpoints of Charlie Dean, a fashion-obsessed teen dying to get into the fancy local Green Pastures Academy of Art and Applied Design, via this year's fashion scholarship contest, and John Thomas-Smith, a young man whose first love is really metalwork but reluctantly throws his hat in the ring for the fashion competition because it's his last chance to get into the Academy. Charlie is a bit of an oddball in her school; she dresses "like an old lady" according to others. To herself, though, she is stylish and chic, following the dictates of Diana Vreeland, fashion diva (which just made me love her more). Her chapters open with a "Thought" which is part Vreeland, part Stuart Smalley -- and the tone is perfectly attuned to vintage style books. Charlie designs a glorious, architectural dress for her father's new girlfriend, who she is slowly warming up to. Charlie's dad is a rehabbed drug addict, and so Charlie is always on edge about the possibility of him returning to the drug life alongside his usual sketchy girlfriends. The uncertainty of Charlie's life, emotionally, financially, practically, is drawn clearly, and her strength of conviction comes through in her determination to get what she wants. John, meanwhile, lives with his grandparents who are sweet and supportive. He doesn't know his father, and his mother works in a city far away, seeing him just once in a while; he has a few anger issues as a result. He has a best friend and a long-time girlfriend & the three of them are a solid trio of average teen life. As this fashion competition ramps up, though, and John gets serious about actually competing, his vision of what's possible in his life changes. And this necessarily changes the relationship between the three of them; they don't want him to change, to leave the world they've all constructed. John sees other artists of all disciplines at the Academy and realizes he does have ambitions and that artsy people are not the dorks he and his friends have always made them out to be. So these two manage their complicated home lives even as they are rhapsodizing about fashion and ambition and possibility. The voices of each character are distinctive, realistic, and enjoyable. Juby studied fashion design herself (briefly, as she notes in the afterword) but as a result, the love of fabric and texture and design is authentic and absolutely real. I could feel my stitching mind racing after some of the descriptions of what people were making -- what fabric did they use? How could I copy that? And so on. It's a fast-paced story with lightness and warmth, despite the serious issues of class, drug use, domestic violence and more. There are some really touching moments, some well-developed emotional connections, and bad decisions by both characters actually have consequences. There is no fairy tale ending but there is optimism and hope nonetheless. I found this book uplifting and engaging, and I really loved it. Highly recommend to teens who are searching for their artistic path or who are really into the Maker scene, especially those who love Project Runway and similar things. Susan Juby is an honest and empathetic writer whose portrayals of the two unusual teens in this novel are complex and replete with understanding. It really hit all the readerly high spots for me. Thanks for sharing this review! Sounds wonderful- and I'm off to order it!